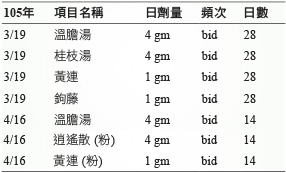 Taiwan's National Health Insurance system in Chinese and Western medical system track parallel, People may also use Chinese and Western medicine treatment, the same time the use of traditional Chinese medicine and Western medicine. Case patients taking medicine for nearly 2 years, good symptom control and medication no allergic reaction, After the occurrence of traditional Chinese medicine and scientific seemingly urticaria symptoms after discontinuation of seemingly scientific medicine urticaria symptoms. 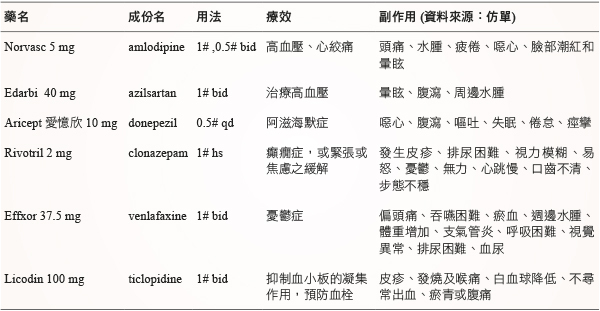 Query patient medication history, living conditions, due exclusion of pure traditional Chinese medicine cause skin rashes, The reason may be due to the elimination of Chinese medicines CYP450 enzyme activity, indirectly increase the efficacy of Western medicine, Western medicine side effects relative risk increase. After confirming the relevance by the Naranjo evaluation form, it is a "possible" case. 1.Davin M.Roger B.Susan L.Scott Appel.Ronald C.: Trends in alternative medicine use in the United States, 1990- 1997, JAMA. 1998; 280(18): 1569-1575. 2.Jun-Ying Fu. Xu Zhang. Yun-Hua Zhao. Dar-Zen Chen. : Global performance of traditional Chinese medicine, Sci- entometrics 2012; 90 : 945-958. 3.Jonas, W.B. : The Evolution of complementary and alter- native medicine (CAM) in the USA over the last 20 years. Forsch Komplementmed 2013; 20 : 65-72. 4.Fang-Pey Chen, Tzeng-Ji Chen, Yen-Ying Kung, Yu-Chun Chen, Li-Fang Chou, Fan-Jou Chen, Shinn-Jang Hwang. 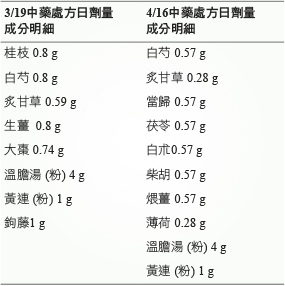 : Use frequency of traditional Chinese medicine in Taiwan. BMC Health Services Research 2007; 7(26): 1-11. 11. Herb-Drug Interactions. Drug 2016；65：1239, 2005. 13. Lin CC: Update on drug interactions with grapefruit juice. J Taiwan pharmacy 2010; 26 :123-30.